The 1.2 km stretch dividing the Gothic area from El Raval is today one of the most famous streets in the world, and perhaps there is no other street which so defines a city. 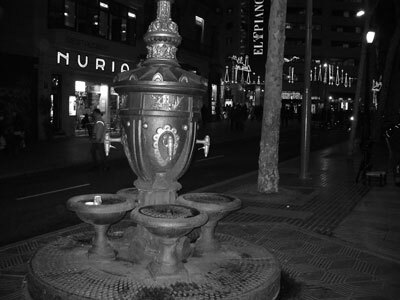 Rambla de Canaletes with the font de Canaletes, a fountain from which if you drink you are condemned to return to the city. Barça fan traditionally congregate here to celebrate victories. The tradition dates from the 1930s when fans would gather here to read the scores of Catalan teams written on a blackboard outside the offices of the defunct newspaper, La Rambla. Rambla dels Estudis: In reference to an old university that stood here until 1843. Until the beginning of the 18th century Las Ramblas was basically a path along a stream which ran between convents (Caputxins, etc) on one side and the old city walls on the other. 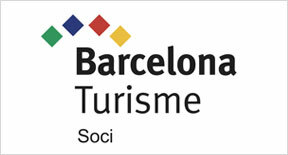 The first houses on the Raval side were built in 1704 and the first trees were planted. 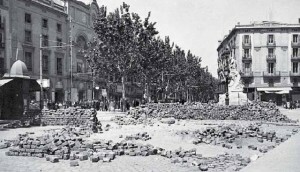 In 1775 the old city walls protecting the Drassanes medieval shipyards were demolished, and towards the end of the 18th century the street began to be systematically developed: here on la Rambla became a kind of tree-lined avenue. The street ends in with the statue of an almost certainly apocryphal Catalan Columbus, built for the 1888 Universal Exhibition, pointing towards Libya, across what, as Robert Hughes has noted, was at least a Catalan sea. 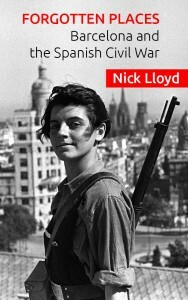 ” Down the Ramblas, the wide central artery of the town where crowds of people streamed constantly to and fro, the loud-speakers were bellowing revolutionary songs all day and far into the night. And it was the aspect of the crowds that was the queerest thing of all. In outward appearance it was a town in which the wealthy classes had practically ceased to exist. Except for a small number of women and foreigners there were no ‘well-dressed’ people at all. 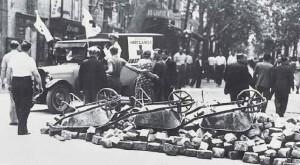 Practically everyone wore rough working-class clothes, or blue overalls or some variant of the militia uniform. All this was queer and moving. There was much in it that I did not understand, in some ways I did not even like it, but I recognized it immediately as a state of affairs worth fighting for. Also I believed that things were as they appeared, that this was really a workers’ State and that the entire bourgeoisie had either fled, been killed, or voluntarily come over to the workers’ side; I did not realize that great numbers of well-to-do bourgeois were simply lying low and disguising themselves as proletarians for the time being. About midday on 3 May a friend crossing the lounge of the hotel said casually: ‘There’s been some kind of trouble at the Telephone Exchange, I hear’. For some reason I paid no attention to it at the time. Today La Ramba is said to serve as the “emotional hub” of the city, though sadly with the invasion of The Tourist International, the city and its people is fast losing control over its beloved street. A 2007 study in La Vanguardia claims that 81% of the 100 million odd people a year who walked down the Ramblas are now tourists.